“Oooh you are soooo talented!” Anyone who reaches a certain point of competence in any creative area can expect to receive this plaudit. Before I started to write in this blog I never really thought about what it might actually mean. On the rare occasions it came my way I would just shrug it of with a sort of semi-grateful embarrassment. They might think I was granted a special ability, but I was always completely certain that I was not. The word talent was once a measure of weight like pounds or kilograms, around 25kilos although it varied between cultures. I was also a measure used in weighing silver and from there perhaps became a measure of worth. We however use it as a description of inherent aptitude. Here the word “natural” creeps in. Natural talent… from here it is only a small step to “God given.” Which is where my hackles start to rise! In some ways the word talent is used by people to explain why others can do a thing they cannot quite imagine they themselves doing. If you believe some people are special and “gifted” then it absolves you from not having devoted any appreciable effort to achieve similar yourself. Once you start to look the same idea is deeply embedded into our world perception. We believe in gurus, priests, geniuses, high fliers, heros, astrologers, quacks and film stars. We believe in “special” people, no wonder superheroes are so popular at the box office! In the finance world people believe in magic people who can, “Beat the market” this is despite really good evidence that this is not the case. The trackers and computer controlled investment algorithms consistently trounce them on average every year. People believe in super powered CEOs and executives who need to be paid vast sums for their magic touch. Really they were perhaps only competent and just got very lucky once or even incompetent and lucky will do. Having got lucky the mantle of specialness is laid across the shoulders of that person and they are duly expected to get lucky again. Intelligent people may know that the evidence is against this magic being true, but in practice continue to act as it it were true anyway. For the same reason gamblers who are perfectly aware of the rules of probability still hope for the magic benison of “luck”. I try not to swerve too far off the topic of painting, but once I started looking at where we see “magic” people I found them everywhere. Politicians, the myth of the “strong” leader, which people still cleave to even though most examples led to large piles of dead people. Healers, saints, scientists and mystics they all seem to benefit in different degrees from the invisible halo of talent. It is interesting to see who doesn’t get the plaudit… you might be a talented garden designer but farmers don’t seem to get to be magic. No one ever said, oh you are such a talented window cleaner or plumber. Artists and Architects get to be talented with wings on their heels but Builders and Bricklayers are born to live forever with feet of clay. Actors, musicians, writers and sporty types get to be special but stagehands, roadies, librarians and groundsmen do not. I cannot help but notice you can get to be “special” by either luck or hard work. You can do something so well that people elevate you or the media can randomly focus on you and garland you with specialness like it or not! For a painter then talent is a worthless plaudit, getting good and improving at your craft is the aim and the is not done by any kind of magic. We have varying intelligence and propensity for being patient and determined. It is these factors not any semi mystical “talent” that makes an artist. I always find it interesting how the eye can conjure a figure in 3 dimensions from a few blobs! Not many of these super quick ones succeed between one does it makes all the duffers worth it. I don’t know why it is but a square sable brush is so much better to paint the figure with than a round one. Odd really as you would think the rounded human form would be more in tune with the latter. 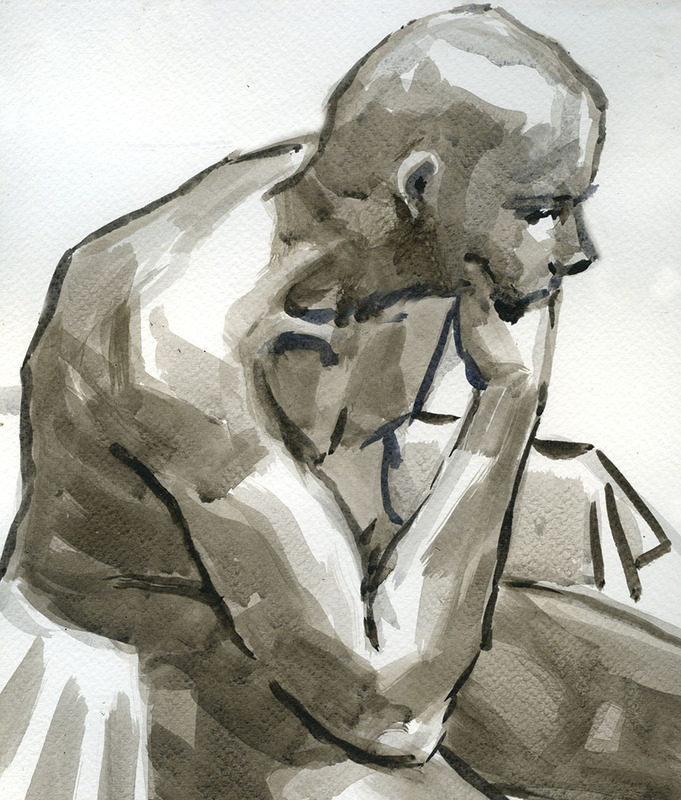 I find it a great benefit to change media with life drawing, it encourages you to focus on different aspects of the figure. 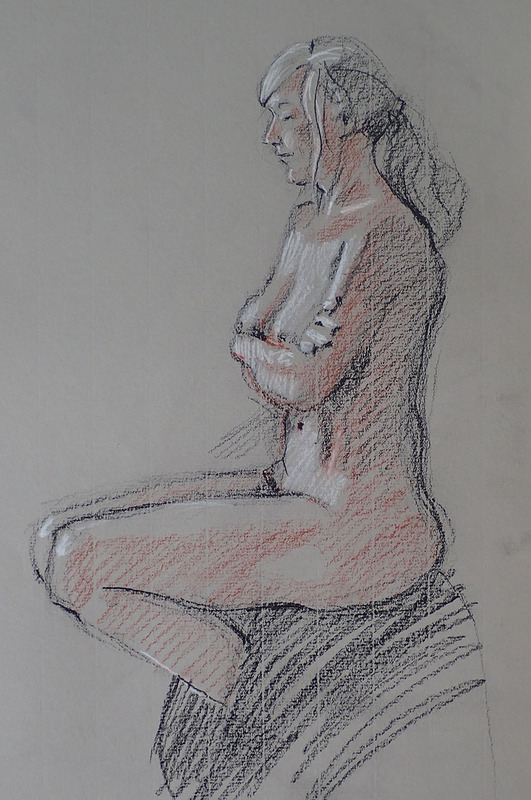 Life drawing has this built in time constraint, the model is going to pose for this long only and that is your one chance. I was pleased with this one, it is sadly rare that you manage to say just enough in the right places and not too much in any area. 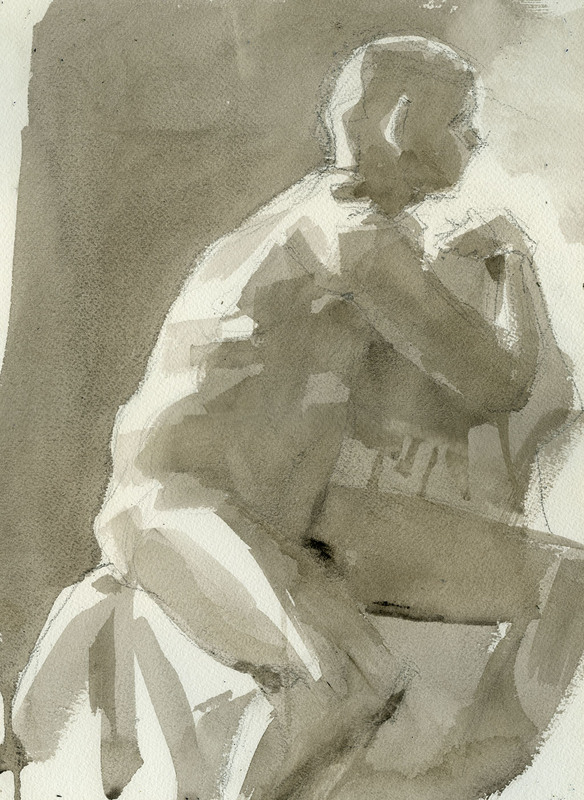 I am trying to more frequently allow the figure to be cropped by the paper’s edge. This makes you concentrate on the shapes made by the areas that are not person. I always seem to do better when I don’t think about the whole to much but just add observation to observation until the time runs out. Strange that the resulting drawings don’t look unfinished even though had the time been extended I would have presumably carried on adding marks. You can always see where you lost concentration. Here I was going well but let the whole thing down by not looking hard enough at the chest and stomach. Or maybe by making unnecessary marks that were not backed up by observation. One thing I strive and often fail to do is avoid seeing boundaries that I know are there but cannot quite see. It is perfectly OK if we are not sure quite where the figure ends and the room starts. That is after all often the case when we observe our world. 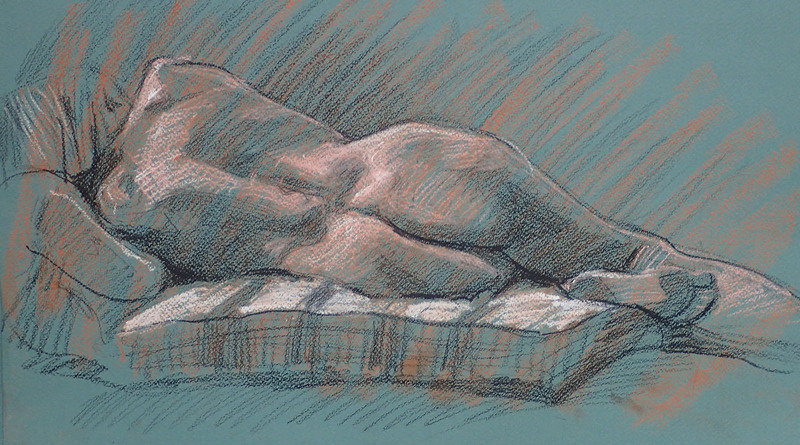 In practice that means marks can flow past the figure’s bounds and a line can be part of both figure and background. It is so hard to consider all the factors at the same time and I sometimes don’t try and focus on one aspect. Here it was direction and weight of line. Here I really had to resist the temptation of seeing too much when due to the light I could actually see very little. People often concentrate on confidence and certainty, but uncertainty and tentative conclusions are actually a large part of our seeing experience and there is nothing wrong to my mind in expressing that aspect in a drawing. One where I used patches of line direction to build up the forms. 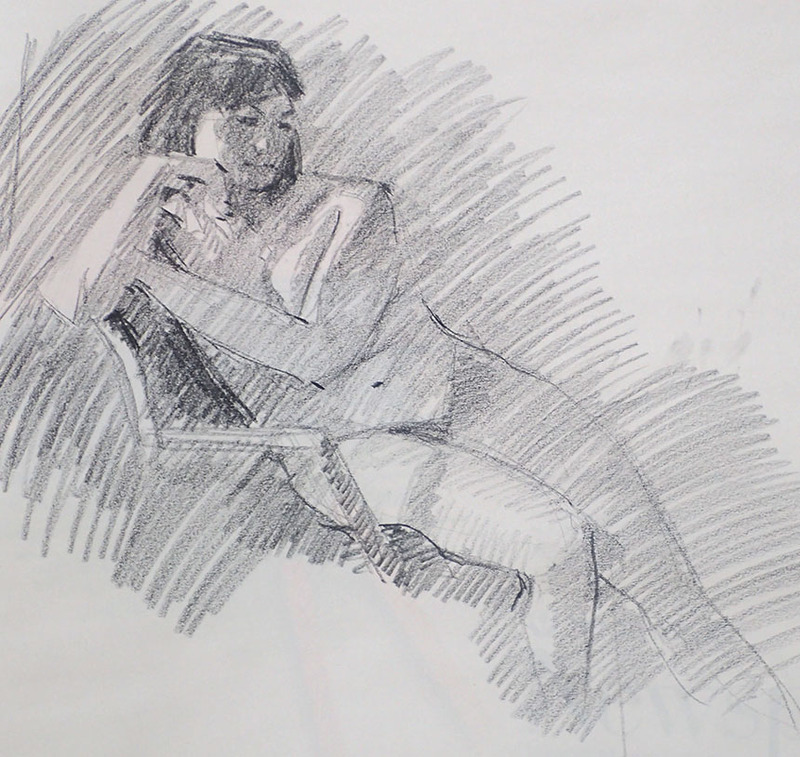 It was the model’s first experience of posing and when I look at the drawing now there is a hint of the nervous tension that the new experience provoked. Later in the same session she has relaxed. Toned paper is wonderful for life drawing as it means large areas don’t need to be drawn at all! 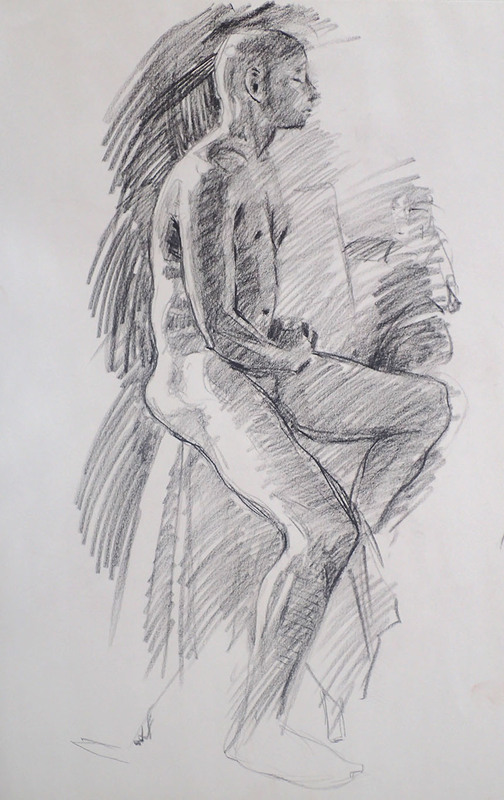 This season we have had a mix of male and female models, it shouldn’t make any difference but somehow the subtle differences of proportion and degrees of external form revealing underlying structure make the experience of drawing each fascinating in a distinctive way. That is it for life scribbles. 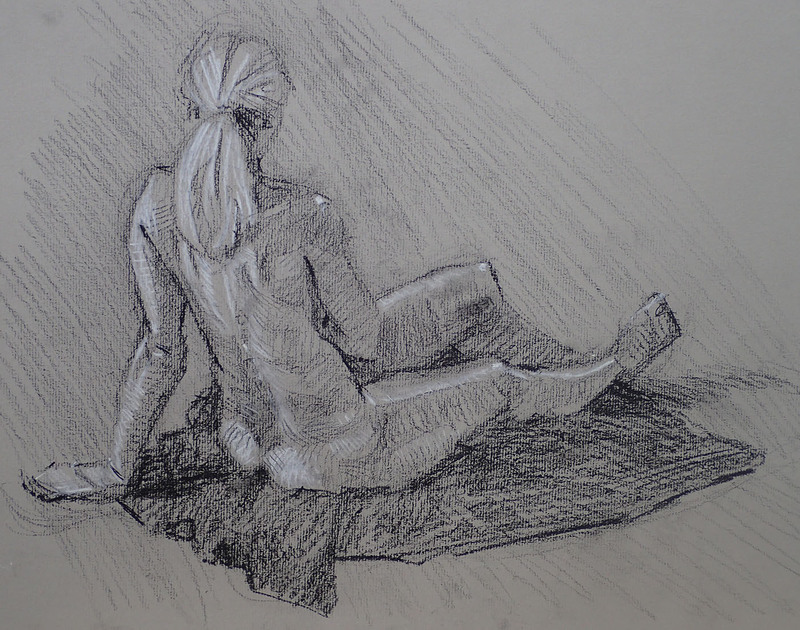 I have recently taken to using oils in the life sessions for the longer poses which has caused some thrills and quite a few spills as I struggle with the process! I find it odd how particular techniques in painting get a fan club type following. Wet into wet for watercolour is one and I suppose plein air another. Sight size is an interesting one. 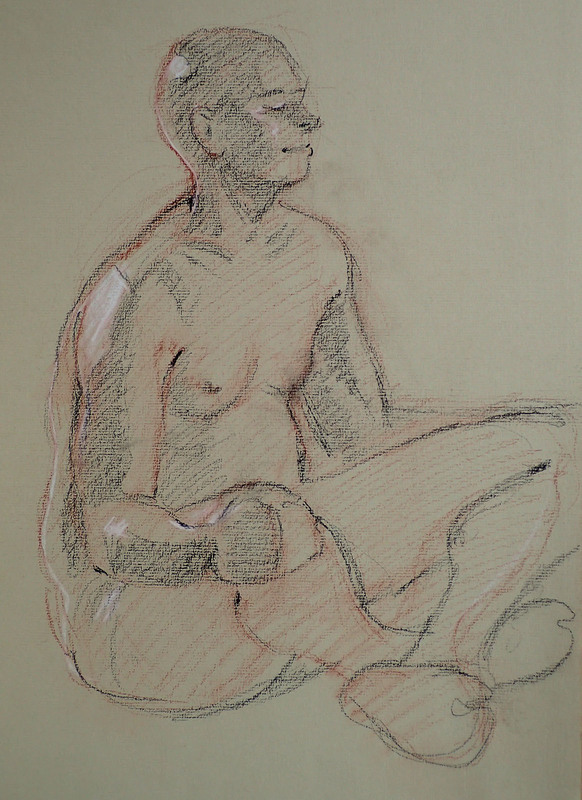 It comes from academic training where you set up your drawing of a plaster cast so that from a certain position both cast and drawing appear next to each other at exactly the same scale. All observations need to be made from this viewing point. It was much used by portrait painters such as Singer Sargent to get good likenesses and accurate tones. Although it appears Sargent only set up the painting in this way for parts of the process and to check progress. It was never intended however to be a method used in all circumstances. Here is a link that gives a good description of the method: Sight Size. If for example you want to paint a wide view then getting both your scene and the painted image the same scale would be pretty tricky. 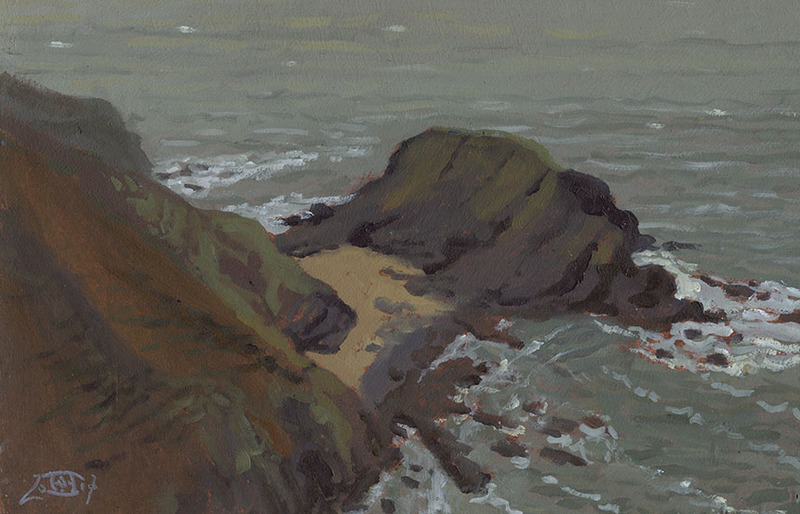 Also if you were painting a subject that was far away then your picture would have to be very small or your viewing point would have to be a very long way from your canvas! Sight size drawers tend to use plumb lines etc though a threaded frame over the subject would seem to be easier and quicker IMO. This is not a debunking of the method, I think everyone would benefit from learning and trying it. I do however feel over reliance on the method can produce rather stiff soulless paintings. 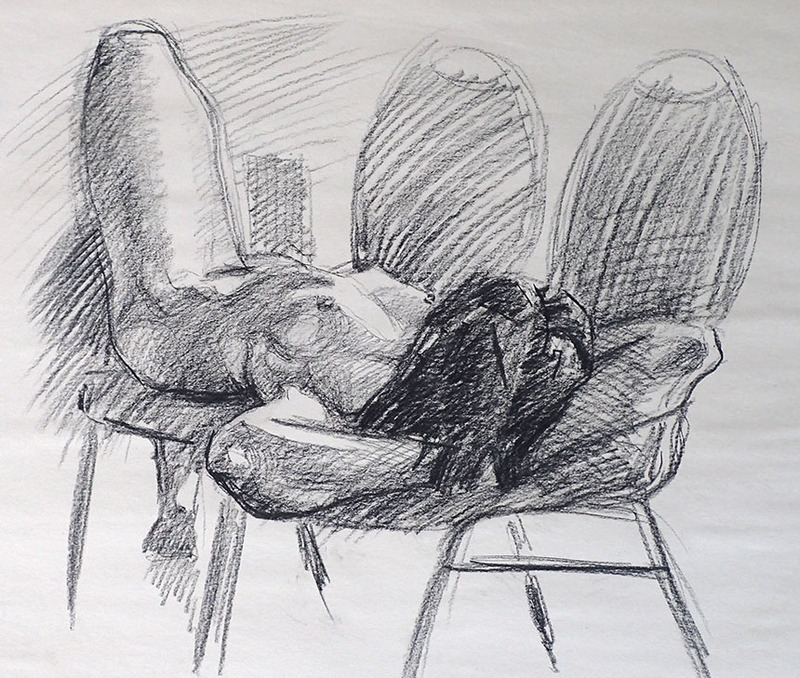 The method shows it’s weakness in the work of atelier students who tend to produce identikit sub Sargent paintings and academic drawings that all seem to be from the same dead hand. That said many of those students move on and successfully establish their own identity. Really the method is part of a whole suite of techniques to get the perceived and very 3D world down on 2D paper. Plumb bobs are good if you have never used one then I suggest you give it a whirl. If you use a black thread you can put little blobs of white paint every inch which helps transfer information. Their main use though is to make it easy to determine how things in your subject relate along a line. You can use it to translate horizontal information or angles as well. All of these methods depend on you returning to the exact same position to make your measurement. The easiest by far to use but more tricky to set up is the threaded frame. Really you need a separate stand for the frame, but as with the plumb line I would encourage everyone to try it out. What I would not advise however is to make any of these methods into your everyday standard painting procedure. Their use is to teach you how to make comparisons of scale angle and alignment. Your aim in using them should be to evolve the ability to do those measurements by eye, this may seem hard but it is surprising how quickly the brain catches on and eventually they become second nature. Nonetheless I still get out my frame for work where it is very important that exact proportion are achieved. Its disadvantages are that it is a monocular method, it allows you to see the world pretty much as a camera does. In turn this means it has all of the problems associated with camera images, the distorted proportions at the edges of the frame which become impossible to hide as the view widens. The method assumes we should only see what we can see with our head fixed, but to my mind this is only a small part of the visual experience, it is literally too narrow. 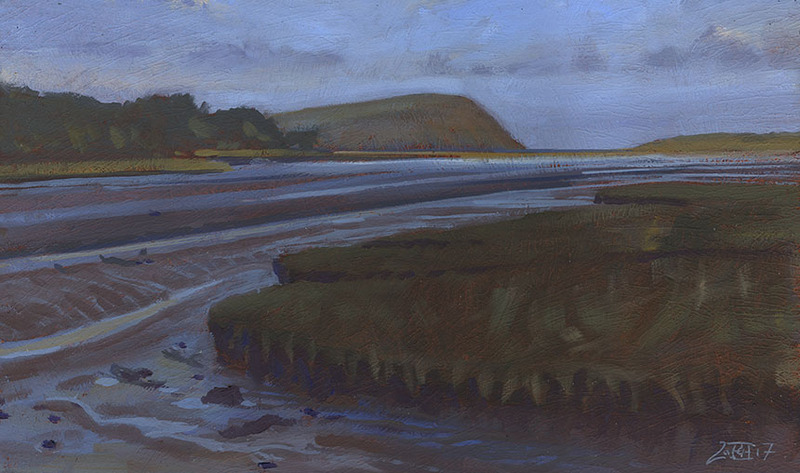 To paint wider or higher than convenient views requires a whole other set of skills including constructive perspective both linear and hyperbolic. Also a number of adjustments such as sliding vanishing and eye points. Although this sounds hifalutin and complicated the actual application can be taught to anyone in a day or two. A very mixed bag of work in this post as I have been dodging between media . 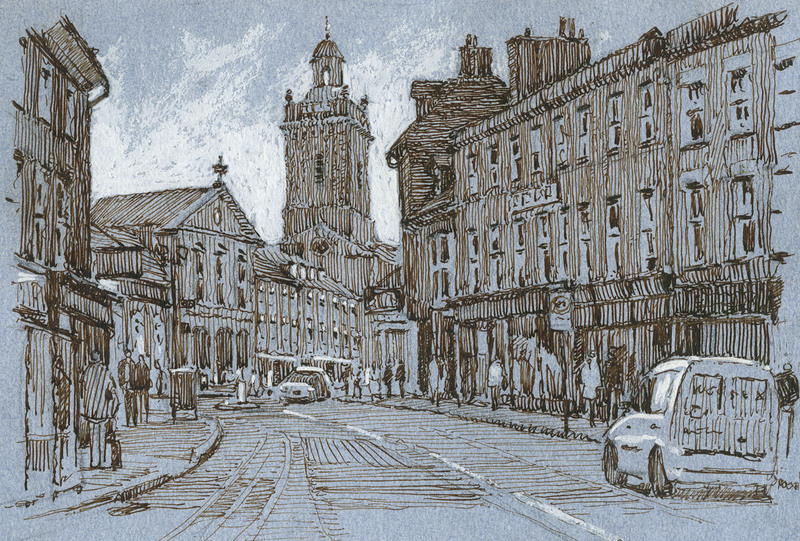 This is Blandford Forum in Dorset. 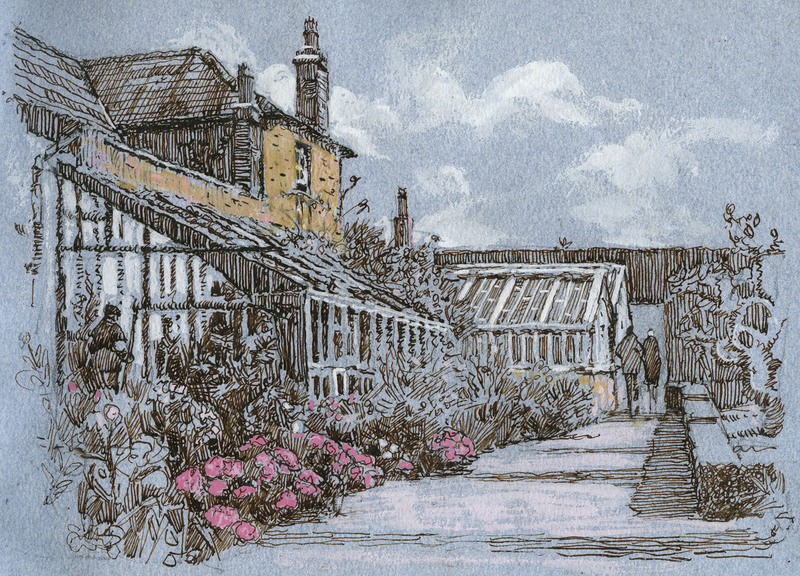 The challenge here was to reduce the busyness of the scene without loosing the impression of complexity. If you succeed in doing this people come up and say, “Oh look at all that detail” and “Just like a Photograph!” For windows it is important to get both consistency and variety into them. So I try to keep the position and rhythm accurate but vary the mark made to indicate them. Pen and Ink. Here is one where sight size would let you down! You would have to have your nose touching the paper to get this view. The camera could not produce it either, the building on the left would be very distorted. It is really a composite view as I am both raising my head to look up and turning my head to look left. A point that is vital to fix is the one where you look straight ahead. People assume that in a drawing the straight ahead point must be in the middle but here it needs to be far to the right where the road ends. Each of these movements causes swings in perspective that result in distortion. So what appears a simple scene is actually quite complex to construct. 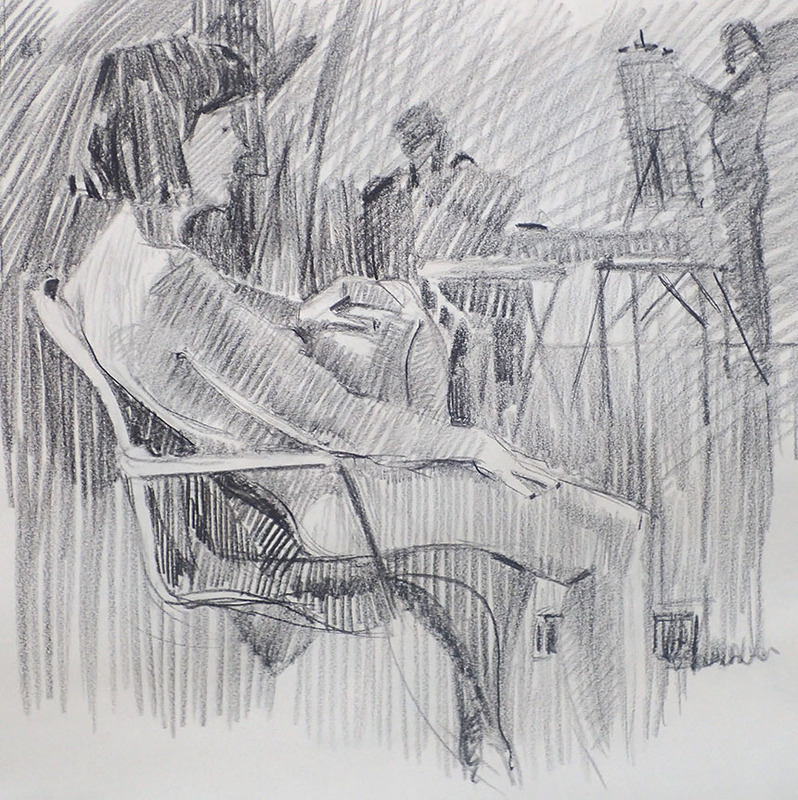 In practice I sketch in the rectangles of the facades and adjust them to find the best compromise between observation, what I “know” is there and the restrictions of a flat surface. Here the key line to track is the join to the walls and roofs. Pen and Ink. This is Llanerchaeron in Wales a beautiful walled garden. I only had time for this quick sketch but would have been happy drawing there all day. I decided in the end it needed slight touches of colour. This is always tricky as the temptation is to add more, but I think greens would have been too much so I left them all out. 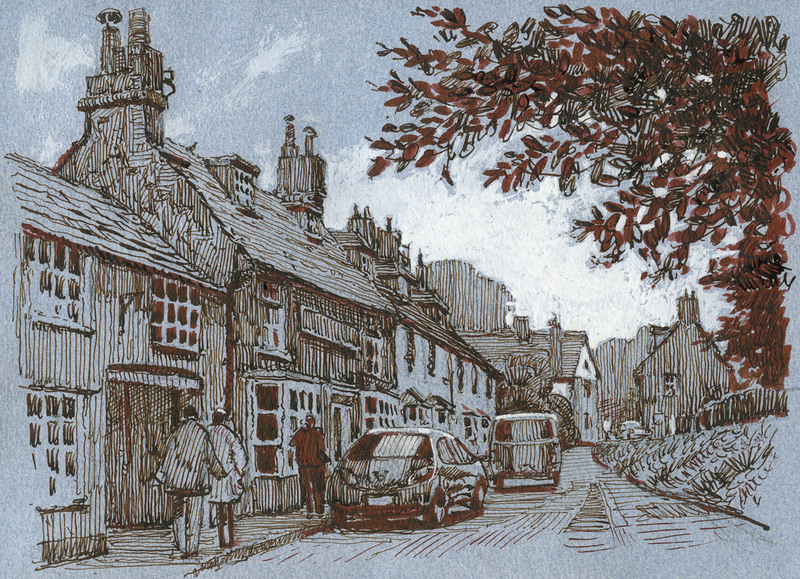 Pen and wash. This is St James in Shaftesbury. I very rarely do a half sheet en plein air in watercolour as splashing it on with big brushes is the only option so the drying time becomes key. The other reason is that they are expensive to frame, rarely sell and if you do sell they get a lower price than a far smaller oil. 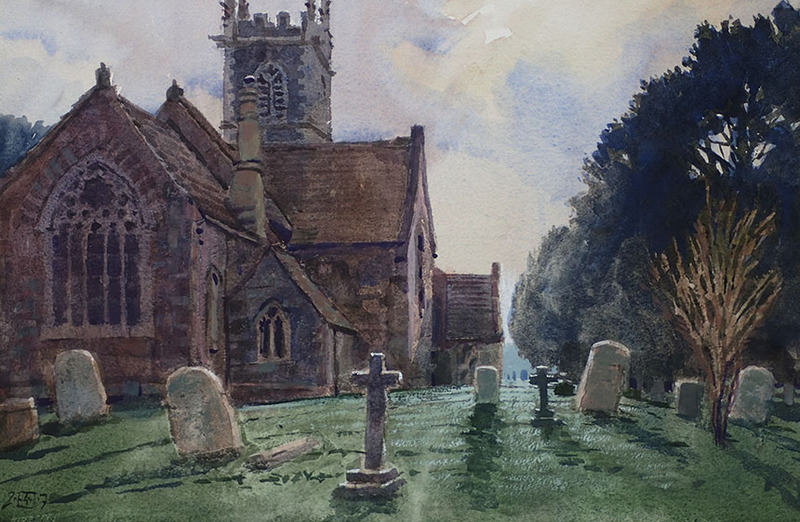 This subject was a gift though and it was great fun to paint as is often the case the light improved as I worked but with watercolour you cannot easily chase the light. Once I got home I felt I could get more atmosphere in by washing back and as it was a 1/2 sheet I used the garden hose! It is nearly always worth taking such risks I find even if a few almost alright watercolours bite the dust. 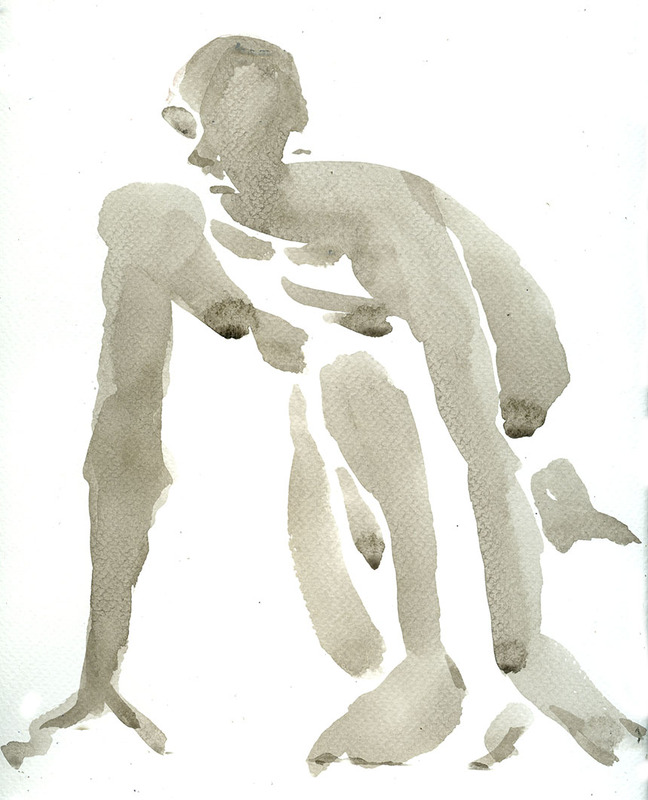 Watercolour. This one put me through the mill and I nearly abandoned the whole thing. 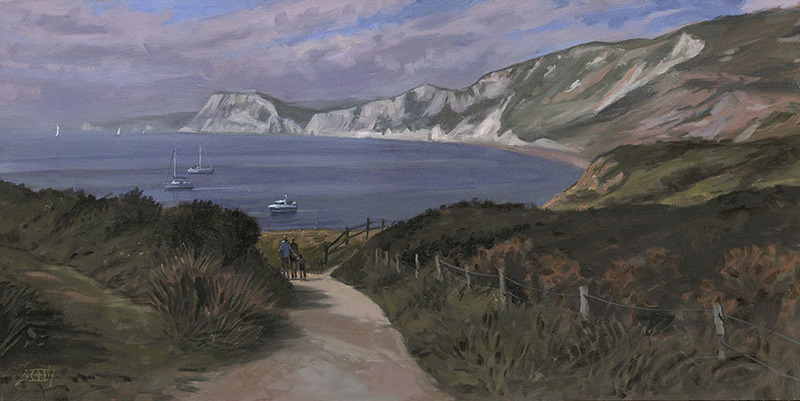 It is Warbarrow bay near Tynham in Dorset. 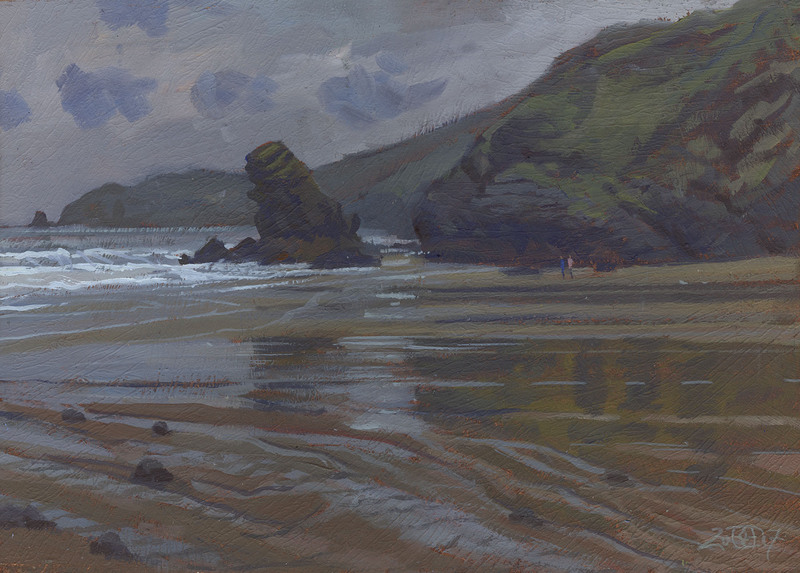 I find these looking down at bays type compositions very difficult especially when they include foreground. I had a plein air watercolour and photos but I still ended up trying several different tonal arrangements over a few weeks. It still may not be finished, I might cut it down as I think a better picture could be had by loosing a 1/3 rd of the right hand side. 24in by 12in Oils. 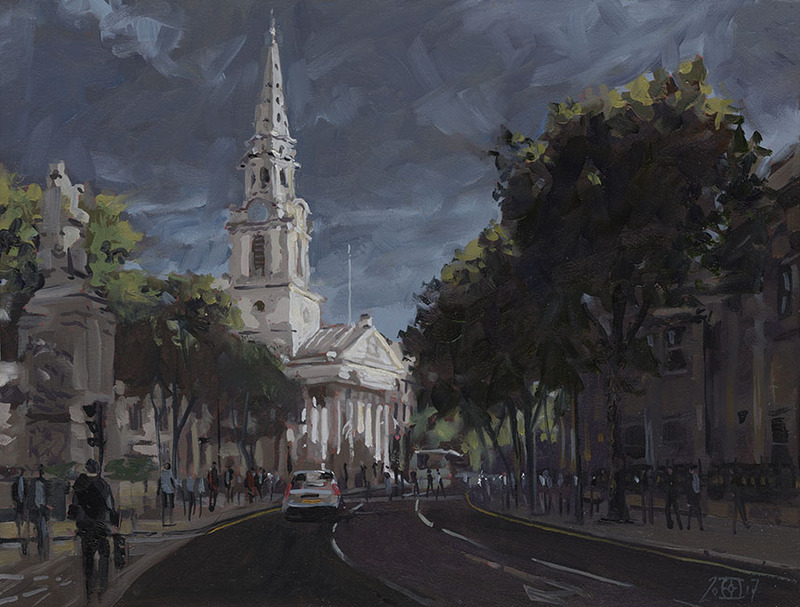 I recently visited London to see some exhibitions and just before the heavens opened the light on St Martins in the Fields was fantastic. No paints with me so this is done from phone snaps. Another one that might loose a couple of inches from the top! 16in by 12in Oils. I escaped to Wales for a few days and was greeted by blustery weather and fantastic skies and seas. 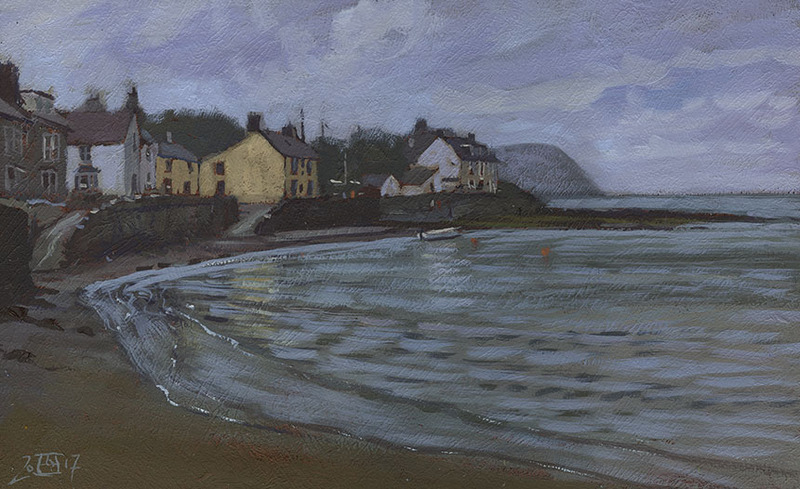 This is Newport in Pembrokeshire and I had very little time to paint before being chased off the beach by the tide. I got rather too involved with the ruffled surface of the water which seemed to have every colour under the sun in it. 10in by 8in oils. 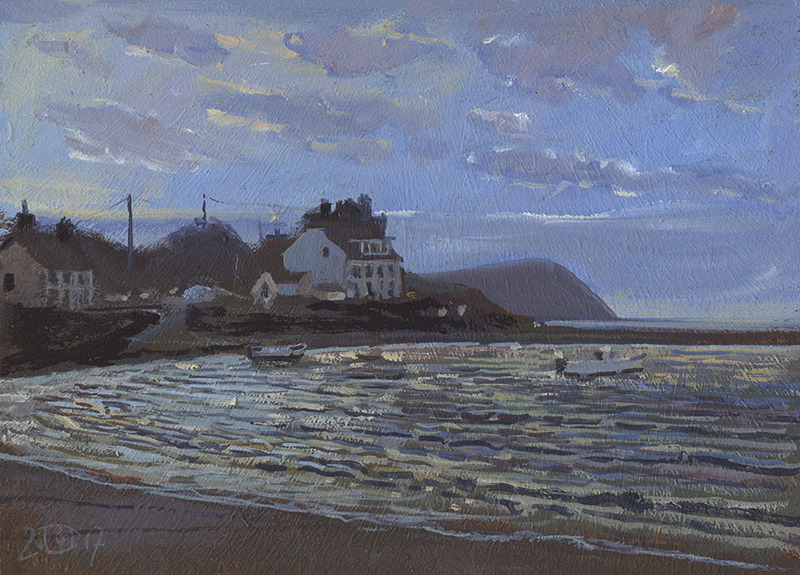 This is Ciebwr Bay near Moylgrove in Pembrokeshire. This is painted sight size as I hadn’t used the method in a while. I can’t say it made much difference as far a judging things goes, a little easier to judge relative tones maybe. I did use my tone guide which is just a bit of very black plastic with a dab of titanium white on it. This allows you to more easily judge how far away the darks are from being black and the lights from white and their average hue. It was astonishingly windy and I had to anchor my easel to some big rocks. It makes it impossible to do really accurate brushstrokes as your board is flapping like mad! 12in by 10in Oils. Done on the same day but a bit down the coast. I had almost given up finding something to paint when I spotted a patch of sand that made an interesting contrast. Even windier than the last but very interesting to paint. 12in by 8in Oils. Another day another cliff top. 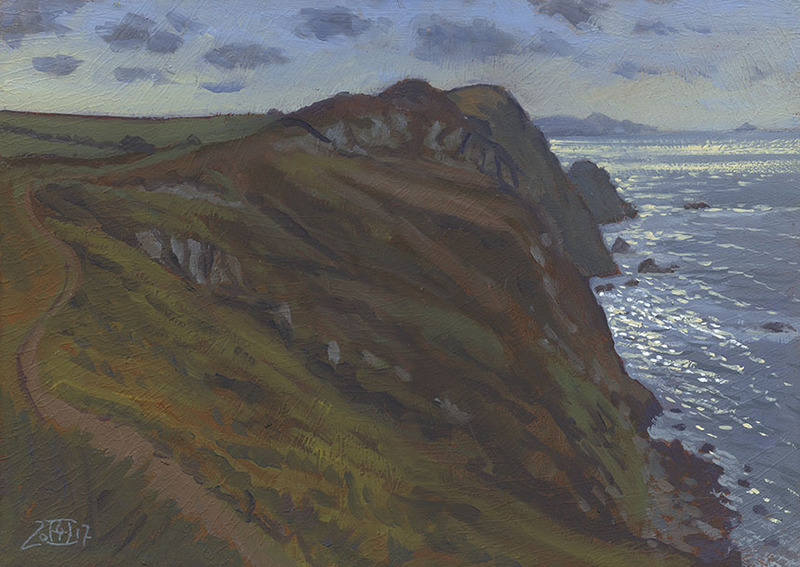 After a rough block in I kept my eye on the changing sun light sparkling on the sea, the whole key of the picture had to be organised so that the highlight would eventually be punchy enough. This meant keeping the landscape tones within quite tight bounds. To much highlighting would have ruined the balance. Another very windy one it was only possible by backing up close to a wall. 14in by 10in Oils. Yep it’s another windy beach! 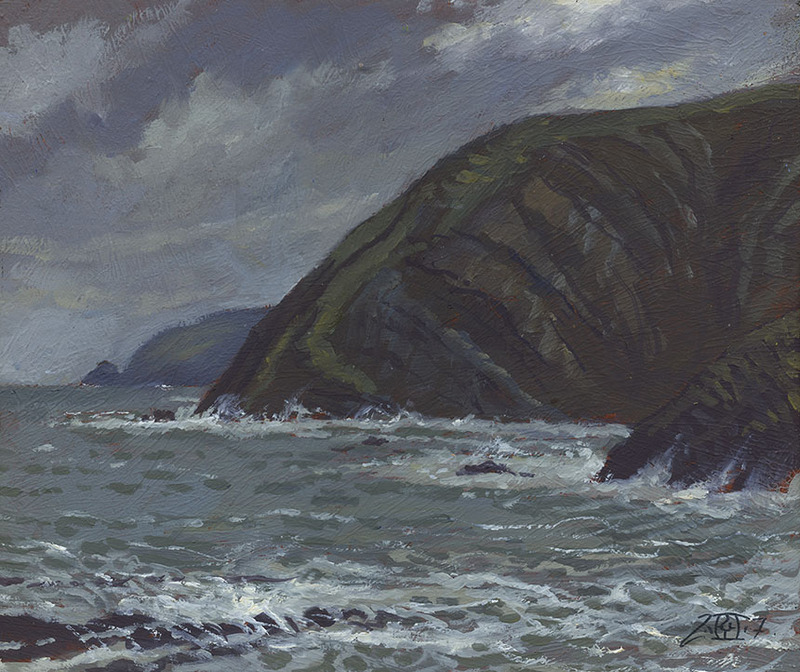 This is Llangrannog near Cardigan. Sight size again as it was convenient, it did help here in getting the drawing in quickly, the method makes drawing errors very easy to spot. Many pauses as the rain came down, though I loved the muted tones the foul weather created. I still far prefer painting on a stormy day than a bright sunny one. 14in by 10in Oils. This is Dinas Head from Newport. Only a very quick sketch. The light was changing rapidly as the cloud shadows brightly lit or threw different areas into shade so I might do a studio one or over paint this one using the various photos I took as it changed as reference. 16in by 10in Oils. More Newport and more very muted light. I might chop this one down and frame it tighter. I loved the tone of the yellowy house, very hard to get right and I wiped and redid it at least 5 times. 16in by 10in Oils. 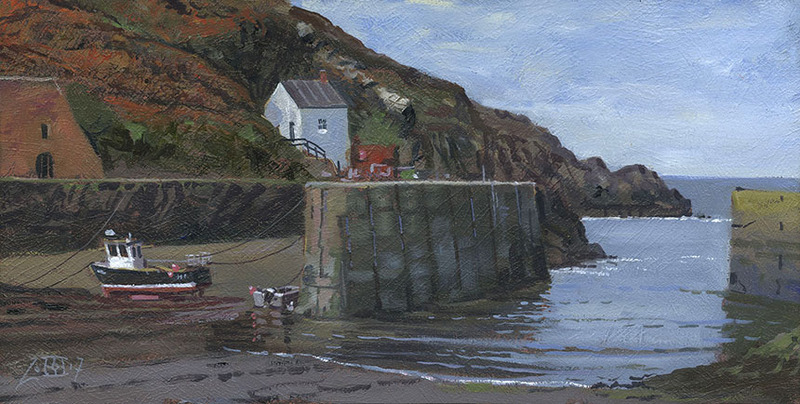 I took my time with this one, it is Porthgain which would like to do more of as it has very interesting part ruined industrial buildings. I was nice to paint a calmer brighter moment with the storms over. 16in by 8in Oils. For the visit to Wales I used a quite restricted palette heavy on the earth tones as follows: Cobalt Blue, Unbleached Titanium, Titanium White, Naples Yellow, Raw Umber, Burnt Sienna and a tiny bit of Cadmium Orange on the last one.